Chris Saunders won the JVAC match. It wasn’t the best of weekends for local anglers fishing big events around the country. The biggest individual final in angling right now is the Maver Match. 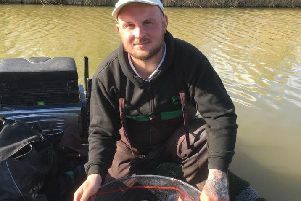 This event was fished on Larford Lakes and we had three local rods - John Whincup, Matt Arnold and Ben Fisk - included in the 24-strong line-up. Unfortunately it all went wrong for them. Arnold couldn’t find any amount of fish, Fisk found it tough going and Whincup, despite a great first half to the match where he was well up with the leaders, suffered in the last period as he struggled to catch from the margins. Well done though to the trio for making it to the final and I am sure they will be fighting hard in next year’s event to give it another go at getting their hands on the £50,000 plus winner’s cheque. For the record Pete Upperton took the honours and I hear he is still celebrating! I am sorry to say it was a day to forget on Sunday when JVAC went into action in the Angling Times/Bait Tech final fished at Barston Lakes. A lot of travelling to practice was to no avail as on the day it all went wrong. A cold night followed by a bright warm day with very little wind on the water seemed to catch teams out, especially at the far end of the Main Lake which was flat calm. So the draw was to prove more important than ever. And that’s where the luck ran out for the city-based side as I don’t think they could have had a worse draw and it showed in the result as they did not even make the top 10. Dersingham won the team event and hot peg 124 saw Greenside AS man Mick Phillips turn in a fine performance to take victory with 131lb 10oz. A slightly depleted JVAC club match on the Oak Pool at Decoy Lakes because of the team effort at Barston nevertheless saw some fine weights recorded. There was none better than the 161lb 5oz net of big carp taken by Chris Saunders. The ex-RAF man caught all his fish close in from peg 13 on cat meat. Runner-up from peg 16 was Tom Cole with 144lb, then came Nick Carlton with 141lb 2oz. I managed to keep my good form going by making it two wins on the trot in the Hotpoint AC event fished on my favourite pool at Decoy, the Horseshoe. Drawn on 13, I caught well up in the water on casters but a light north breeze got up for a while and sent the fish down. A change of tactic saw a good run of barbel taken from the margins along with several decent carp to give me 134lb 11oz. Just behind was Paul Faulkner with 132lb 9oz followed by Vincent Stapleton with 120lb 13oz.